Platinum Girl Scout Cookies was created by crossing the controversial OG Kush, Durban Poison, and another strain with a mysterious identity. 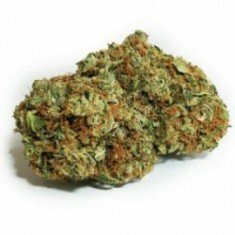 It has a balanced Sativa-Indica composition, although it leans towards the sativa strain given the THC content that has been tested to reach up to 25%. Platinum Girl Scout Cookie buds have a brilliant sage green color and they have a heavy coating of crystal trichomes. These lavishly frosted sage green nugs are also have tinges of dark purple, making the Platinum GSC a truly beautiful strain. The Platinum GSC strain has a pungent smell — an interesting mixture of earthy spiciness with hints of sweetness and berry undertones. It has an herbal and spicy taste with noticeable flavors of berry fruits and candy. With an average THC level of 20%, the effects of this strain are balanced. It delivers a strong high and intense euphoria that is complemented by a significant level of body stone. There is potential for heavy sedation and heavy drowsiness, so be advised to dose in a fashion that is informed by your schedule. Platinum Girl Scout Cookies is quite versatile. It can be used in the treatment of numerous medical conditions. The pain relieving effects can be great for numbing pains from migraines and arthritis. It can also be used in the treatment of Fibromyalgia, a disorder which has symptoms including headaches, fatigue, depression, anxiety, and general body pain. Platinum Girl Scout Cookies can also be used in the treatment of Attention Deficit Disorder (ADD) and Attention Deficit Hyperactivity Disorder (ADHD) symptoms. Platinum Girl Scout Cookies is a highly potent strain that effectively treats both physical and psychological problems. Effective heavy Indica hybrid which helps my physical and psychological problems!!! Heavy stuff, when smoking, Im free from physical and psychological problems!!!!!! Makes me happy and removes all problems!!!!! Loved this weed. Great deal! Wonderful products, its work fast.